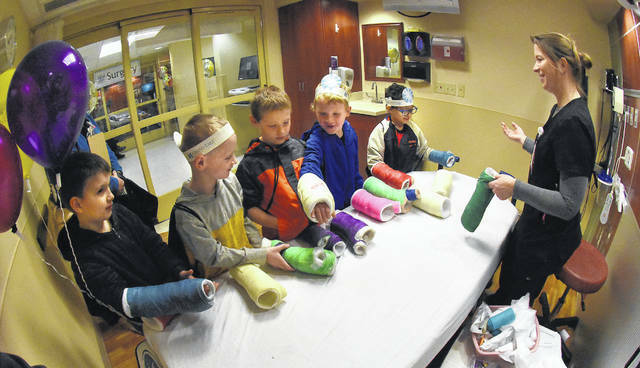 Lisa VonDrell, a registered nurse at Joint Township Hospital in St. Marys, explains how an emergency room works and lets kindergarten students from Botkins try on arm cast. The “Make Believe Hospital” program aims to alleviate common childhood fears about the hospital. ST. MARYS — Kindergarten students from 13 area schools are experiencing the Make Believe Hospital program through Tuesday. This is the 33rd year Joint Township District Memorial Hospital in St. Marys hosted the event, which kicked off Thursday. The hospital developed the program as one method of alleviating some common childhood fears and misconceptions about the hospital. Children will learn about several areas of the hospital including pediatrics, respiratory, surgery, medical imaging, emergency, cardiac, first aid/handwashing and healthy lifestyles. Schools attending include Anna, Botkins, Fort Loramie, Fort Jennings, Hardin Houston, Holy Rosary, Jackson Center, Minster, New Bremen, New Knoxville, Russia, St. Marys and Waynesfield-Goshen.